Both sexes: Golden brown, red, black and white head and yellow wing bar. The delicate Goldfinch has beauty and charm in abundance. This small finch is strikingly colourful with its mixture of red, white and black on the head, golden brown body and bright yellow wing bars. Looking more closely, the lores and crown are black, the chin and forehead are red and the cheeks are white. The body is predominantly golden or tawny brown, but the belly and rump are white. The wings are mostly black with a large striking yellow band. The bill varies from pinkish to pale grey, and the legs are flesh coloured. The sexes are similar except that the male's red face extends slightly behind the eye. Juveniles are generally a dull brown with darker streaking on the body, and lack the red, black and white markings on the head. A pleasant rambling twitter or tinkling best describes the most common call of the Goldfinch. The delightful song is a composition of this call and other rattling notes and is sometimes accompanied by the "pivoting display" in which the male drops its wings slightly and pivots from side to side. 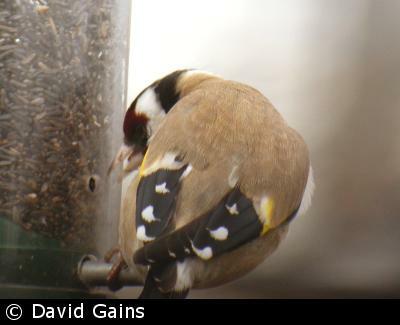 Goldfinches used to be commonly kept as caged birds because of their colourful plumage and enchanting singing. 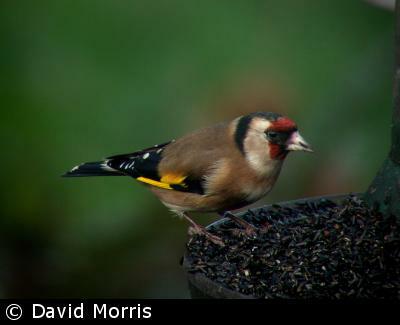 Goldfinches feed on various tree seeds, such as alder and birch, and on thistle, teasel and dandelion seeds, which it can obtain owing to its thin bill and light weight. Niger seed and teasels may attract them in gardens, especially if there are no fields nearby with thistles and dandelions, but they will also feed on sunflower hearts. The cup-shaped nest is built by the female with moss, grass and lichen, and lined with wool and plant down. The nest is usually in a tree towards the end of a branch or in a bush, and often in large gardens and orchards, but also in open woodland and hedgerows. The smooth, glossy eggs are pale blue with reddish markings, and about 18 mm by 13 mm. Incubation is by the female only. The young are fed by both parents. Some of our breeding birds migrate to the south-western Europe, e.g. France and Spain. Interestingly, many more of these birds are females than males, and birds that migrate one year will not necessarily migrate in others. The autumn population is increased by the passage of European birds down eastern Britain. They make the most use of our gardens at the same time in late spring every year - between returning from their wintering grounds and the start of breeding, and at a time when natural food resources are at their lowest. 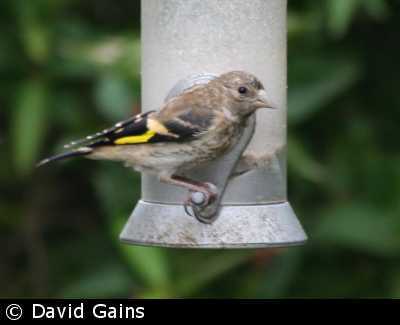 More interestingly, this finch is increasingly using garden bird feeders, this may be because natural resources are in steady decline or more gardens are offering niger seed and sunflower hearts, which are both high energy foods that Goldfinches seem to prefer. 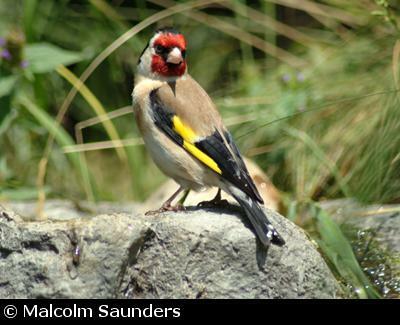 The Goldfinches have more or less recovered from a serious decline in the 1970s and 80s that was possibly caused by increased use of herbicides, but changing agricultural practices still threaten this bird. Consequently, they are subject to a Medium BTO Alert.